I am about to tell you a fascinating story about baggage. Try to contain your excitement. It has a pedagogic purpose though: so that you may be protected against the error I almost made. Let’s do a heavily sherried whisky for Christmas. 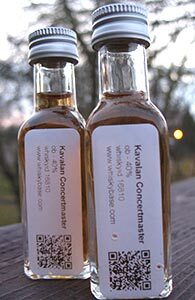 Kavalan did very well at the most recent Malt Maniacs awards and that pushed me to finally dig out this sample purchased earlier this year and review it. I’ve quite liked the few Solists I’ve tasted so far (far more than the overpriced and overrated standard range) but of those I’ve only found a fino cask to be truly exceptional. Will this regular sherry cask be as good? Well, if it’s only as good as the last one I reviewed I won’t complain too much. Let’s get to it. I’ve reviewed a bunch of Kavalans before and not found any of them to merit the hype emanating from some quarters. They’ve ranged from mediocre to very good, but not even the one I’ve liked the most so far seemed to me to come close to meriting the very high asking price. 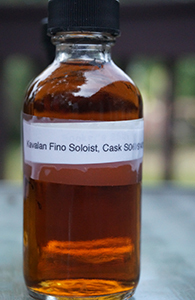 That would be the last Solist Fino cask I tried (cask S061127001). That was an EU release and since then the Fino has arrived in the US and is going for anywhere between $300 and $400 (and doubtless for more at stores that don’t show up online). It’ll be interesting to see what their success will be like at this price point. Will the high price be enough to turn it into a status item for the Christmas season or will we see it discounted eventually? Time will tell, I suppose. But I’ll be able to tell you a little sooner than that what I think the cask this sample is from is worth. 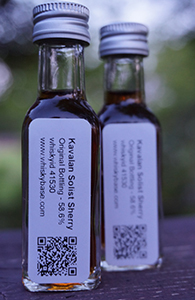 This is the last of my three reviews of casks of Kavalan Solist. I liked both of the others I reviewed a lot–the sherry cask slightly more than the bourbon–but found both to be way overpriced for what they are. I don’t know what this Fino cask is like but it will have to be very good indeed to justify its price, which is twice that of the other two. It is, of course, a fact that these Solist releases are single casks; and so in the unlikely eventuality that you are looking to these reviews for guidance on whether the US releases will be worth it or not, you should keep cask variation in mind. This, it should be said, is another way in which single cask releases are a bit of a boon for distilleries. If all the Kavalan fino casks were vatted and released as one batch the entire release would be susceptible to lack-luster reviews. But with single cask releases even if you don’t like one cask that much (or very much) there’s always the promise/allure of others that might be so much better. Still, I would expect there to be be strong family resemblances between the casks in each Solist range. 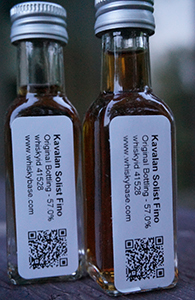 I liked the bourbon cask Kavalan Solist I reviewed the most of the few Kavalans I’ve had so far. But: a) that’s not saying much as the others ranged from poor to ordinary, and b) I didn’t think it particularly great either and certainly not good enough to justify the high price. Up next is a sherry cask Solist released in 2012, and I hope it will put on a better show. Let’s get right to it. 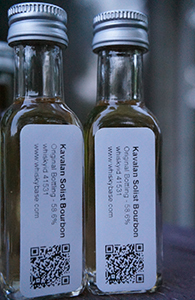 The Taiwanese distillery Kavalan has finally entered the American market. While the anticipation has been intense among American whisky geeks for a while, fears about the prices likely to be charged have come true. Kavalan makes Amrut seem cheap. Where Amrut’s entry-level whiskies, the regular Amrut and Amrut Peated, and even the excellent fusion are all sub-$65 in most markets (the former two usually in the $40-50 range) the entry-level Kavalans are going to be priced much, much higher. As I’ve noted recently, the utterly ordinary King Car Conductor is retailing for $109.99, about $75 higher than the contents of the bottle would merit. This is my third Kavalan. I thought the basic Single Malt was just about acceptable and the King Car Conductor was decent. Now to see what this port finished Concertmaster is like. I’m not sure if this is just the regular Single Malt finished in port pipes or what the relationship is between this one and the higher strength Vinho Barrique (which I have not tried). So many mysteries. So many uninteresting mysteries. After yesterday’s unprepossessing and prosaically named Kavalan Single Malt here is another that is at least more extravagantly named. “King Car”, it turns out, is the name of the conglomerate that owns the distillery. As to whether “Conductor” is meant to call up an image of a man in a penguin suit in front of an orchestra or someone selling tickets on a bus, I don’t know but it’s a good job this conglomerate has an evocative name; though it would also be fun to drink a whisky named Taiwan Heavy Industries Limited or similar. But enough meaningless chit-chat. On to the whisky. The new’ish Taiwanese distillery Kavalan have been the next new sensation in the whisky geek world for a while now, usurping that role from Amrut, who in turn had taken it from Japanese whisky more generally. 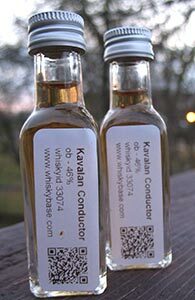 Kavalan’s whisky is not yet in the US but is said to be coming any day now. As I’ve noted before, I’m always a little sceptical about the level of excitement about many new distilleries, especially those from non-traditional whisky producing regions of the world. I’m never sure how much of the excitement is driven by the novelty and how much by actual quality. The charitable reading of the former impulse, I suppose, is that some people do genuinely want to support the early efforts of new(er) whisky producing regions and sustain them as they move to maturity. 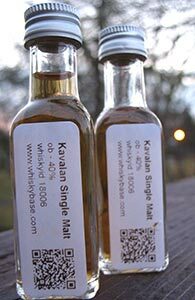 But the whisky I am reviewing tonight is not one of Kavalan’s ballyhooed expressions (those would be the cask strength Solists). This is the entry-level single malt at 40%. Still, it’s won gold medals at a couple of spirits competitions/awards (yes, yes, I know they’re mostly dubious).